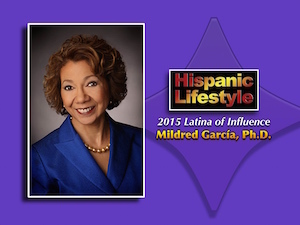 Latina of Influence | Mildred García, Ph.D.
Mildred García, Ph.D. is a 2015 Latina of Influence named by Hispanic Lifestyle. Dr. García is being recognized for her commitment to education, community service and mentorship of young Latinos/Latinas. Hispanic Lifestyle’s 2015 Latinas of Influence will be recognizing Dr. García and her fellow Latinas of Influence during a luncheon held in their honor on at Latina Conference 2015. Mildred García is president of California State University, Fullerton, the third largest university in the state, serving over 38,000 students and with an operating budget of nearly $500 million. The institution is number one in California and fourth in the nation in awarding bachelor’s degrees to Hispanics, as well as 11th in the nation in graduating students of color. President García previously served as president of CSU Dominguez Hills where, as the first Latina president in the nation’s largest senior system of public higher education, she eliminated a structural deficit of $2.8 million; increased media placement by 192%; received the highest reaccreditation from the Western Association of Schools and Colleges; established the Wallis Annenberg Endowed Professor for Innovation in STEM Education, the first endowed professorship in the university’s history; exceeded enroll- ment targets not met for 8 years; increased donor giving by 140% to $3.2 million; increased alumni donors by 400%; and increased retention rates for first-time full-time freshmen by 10%. Prior to her arrival in the CSU, President García served as the CEO of Berkeley College, a for-profit institution, where she was the first system-wide president for all six campuses. In her six-year tenure, she increased enrollment by 25%; established professional advisory boards for academic programs; implemented the institution’s first system-wide strategic planning process; and purchased property and opened a new campus in Newark, New Jersey as well as a residence hall in White Plains, New York. She has held both academic and senior level positions at Arizona State University; Montclair State University; Pennsylvania State University; Teachers College, Columbia University; and the Hostos, LaGuardia, and City Colleges of the City University of New York. She is also a much sought-after speaker at national and international conferences and an academic researcher. & Land Grant Universities; the American Association of State Colleges and Universities; the Congressional Hispanic Caucus Institute; and President Obama’s Advisory Commission on Educational Excellence for Hispanics. She earned a Doctor of Education degree as well as a M.A. in Higher Education Administration from Columbia University, Teachers College; a M.A. in Business Education/Higher Education from New York University; a B.S. in Business Education from Baruch College, City University of New York (CUNY); and an A.A.S. from New York City Community College.